This is Ba Bear. 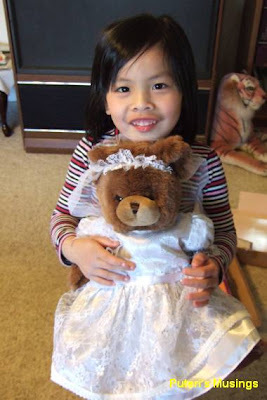 Denice has had this teddy bear since she was two. Her first teddy bear got lost on the second day at day care. She had no choice but to take Ba Bear as a replacement. 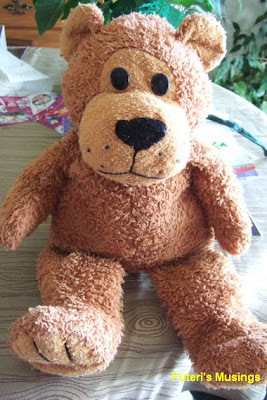 Daddy had bought Ba Bear at the thrift store, even before the first teddy bear got lost. You can see how much she loves Ba Bear. 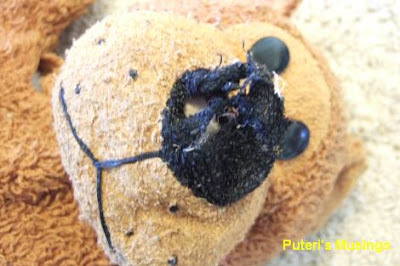 Ba Bear has been stitched together twice before when seams came apart. Look at poor Ba Bear's nose. It has been chewed till there's not much left of the nose. The stuffing is gone from the nose and some from the body as well. When she feels "geram" she will bite the nose! On Friday night, when we were out shopping, she told Daddy she was ready to replace Ba Bear. I told Daddy, there were more teddy bears at home, and there were two that a friend had given the kids that still needed to be put together. This is the girl teddy bear. 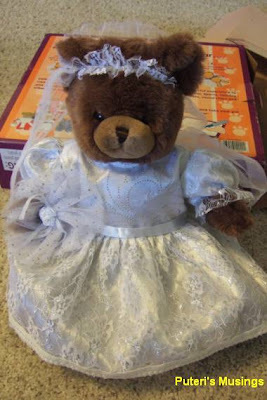 A bride teddy bear. First thing Saturday morning, Denice began pestering me to put the teddy bear together. She just couldn't wait to see the bear in the bridal dress! This is the boy teddy bear. A bear groom. "I don't like it. Teddy bears cannot get married." "Only boys and girls can get married!" You should have seen Denice clap her hands at the sight of this pretty bear. "Oooohh, she is so pretty!" What about Duncan? 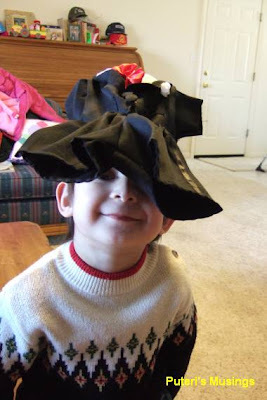 He started fooling around with the boy bear clothes. "Look, Mommy! It is a hat! " Duncan's teddy bear before putting on the clothes. Look at them, with their teddy bears! After putting the two teddy bears together, I then went on to try to fix Ba Bear. Imagine how excited Denice was at the the thought of Ba Bear all stitched back together and more stuffing added! After Ba Bear was stitched back together and a nose job done to it, Ba Bear was thrown into the washing machine for a long over due wash and then thrown into the dryer. Denice could not wait for Ba Bear to come out of the washer when she took her afternoon nap. She even cried. I guess that the bride bear was nothing compared to her beloved Ba Bear! Ta da! Ba Bear all fixed, and cleaned! Guess who got cast aside, no matter how pretty? Yes, the bride bear! Ba Bear is still the beloved teddy bear. :-) Denise is a cute girl, I still having mine too, I'm bite the nose and licking it's fur till some part of bear body are bold. 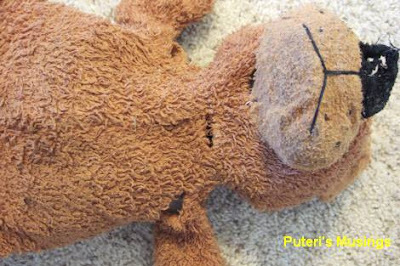 You did a great job repairing Ba Bear, Puteri. No need to report Denise for cruelty against animals. HAHA! aiyoo...my Mishu love her old and tore big Mickey Mouse plush toy since she was born,it's her security blanket,so i'm thinking that we going to asia and i replaced with new big mickey mouse doll,and she refused to touch her,I bring all the way from US,so penat,wasting time and energy.I guess kid like their old smell..You banyak rajin,sew and dress up all the toys. What condition is Annabel's teddy bear in? Are bears monogamous? Haha, I don't know how many times Duncan said he didn't like it .. about bears getting married! haha. Aiyo, PETA better not hear about this particular cruelty to a certain bear! haha. Haha, you brought the new Mickey, and Mishu just ignored it? haha, ya lah, wasting your time taking it with you! Duncan loves his little pillow. Good thing the pillow can be thrown into the washer too, and the pillow replaced! Just get rid of the old one and want it or not, he has no choice but to pick up the new pillow! Have to put the two bears together .. given to the kids soon after they were born. Haha, only now did something to them! Don't want to spend any more money on new teddy bears! Haha. This is so cute. I remember having my first HUGE teddy bear for my first birthday present (it was in the picture. HA) And I still got it til I was about 15, kept it in the room. I don't remember washing it but Mom jemur it quite a lot of time. "Muai kutu iya!" she says. Ok.
Apu, bisi kutu teddy bear nuan, pia Flo? heheh. You're so talented. Fix the Ba Bear until so nice, like new. I didn't have the heart to throw Ba Bear away, since I knew how much she loved it! The broken seams were easy enough to stitch back, but I also think I did a pretty good job of fixing the nose! Heheh. Even though the bride bear is not her favorite, she still wants it on her bed! Enggai iya meri ka nuan Grace .. too possessive! 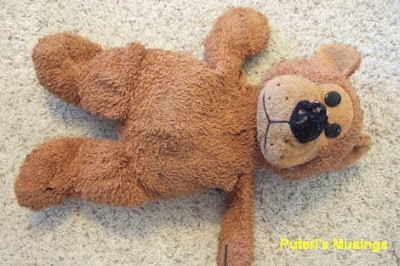 u are the cosmetic surgeon for taddy bears. reconstructive surgery that is. 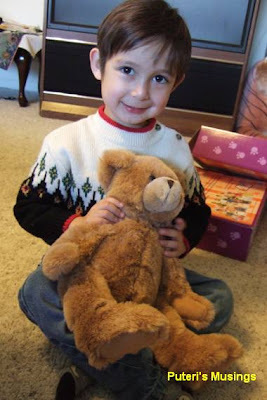 I used have my teddy bears (and other toys) until my nephews and nieces were born. Then they went through a destroying phase and destroyed most of my toys. Huhu..so sad. Chris, lebih ari cosmetic surgeon! Almost like the giver of life to an almost dead teddy bear! Haha. Apu, terok endar nuan nyau laboh tangga ngema teddy bear nuan?! Hehe, nya lah anang ngesan utai besai ari diri empu! Hehehe. Hhahahahah.. Puteri, nice entry. this reminds me of my Gabby's Piglet. sampai anchur idong piglet nya dkunyah ya, she keeps the piglet when she was 2 or 3 like that. that's her fav plush toy. sampai diatu meruan disimpan ya nyo kuning tudah PIglet, ditesah berapa kali agik meh iya semampai sayau ke nya.